John Boriolo topped a 285-entry field to win the @runitupreno VIII Mini Main Event for $26,073. The Run It Up Reno VIII Event #1: $440 Mini Main Event started with 285 entrants, but on Sunday just one remained as John Boriolo came out on top to win a $26,073 first-place prize. He did so by besting a final table that included poker grinders Jesse Capps, Michael Trivett, and recent World Series of Poker Circuit ring winner Ashley Sleeth. 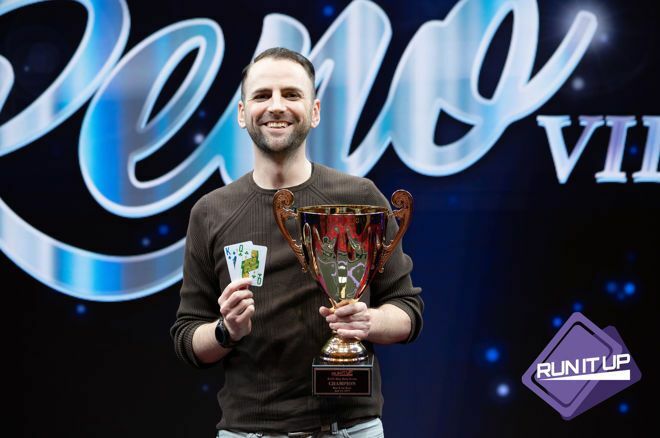 Prior to the win, Boriolo had a single tournament cash on his HendonMob résumé, a 23rd-place finish in the RIU Reno VII $125 Taiwanese Poker for $235. At the start of the day, 64 players returned to the Peppermill Casino, but with only 46 of them slated to get paid 18 of them left emptyhanded. They included Cott Hoffer, Adam Owen, the recently bald Benjamin “Spraggy” Spragg, and bubble boy Steven Dorval. Once the bubble burst the in-the-money finishes came quick and included former RIU Reno Main Event champ DJ Fenton (42nd - $720), Big Brother Canada winner Kevin Martin (38th - $720), 2012 World Series of Poker Main Event runner-up Jesse Sylvia (26th - $880), Ricky “RatedGTO” Guan (24th - $1,080), Andy Pokrivnak (13th - $1,320), and Patrick “IREgption” Tardif (11th - $1,640). Day 1a chip leader Alan Mastic was the first to fall at the final table after his pocket queens were cracked by a river ace against Joel Danforth’s ace-four suited all in preflop. A short-stacked Jason Pease followed him out the door a short time later after losing a race with pocket sevens to Trivett’s Big Slick. Day 1b chip leader Ivan Zarate bowed out in seventh place when his ace-king failed to get there against Trivett, From there, six-handed play lasted several hours before Danforth busted holding ace-four to Boriolo’s ace-king. Capps hit the rail in fifth place after losing a flip with king-jack to Scott Stewart’s pocket tens, and then Trivett fell to Boriolo after a nasty turn. It happened when Trivett got his chips all in preflop holding ace-queen against Boriolo’s ace-nine. A nine spiked on the turn and Trivett had to settle for fourth place and $6,631 in prize money. Sleeth, the fiancé of 2012 WSOP Main Event runner-up Jesse Sylvia, exited in third place after her ace-ten failed to get there against Boriolo’s pocket queens, and that set up a heads-up match with Boriolo holding 3.4 million to Stewart’s 2.3 million. The two talked about working a deal but ultimately couldn’t come to agreeable terms. They played it out, and in the final hand of the tournament, Stewart got it in good holding ace-six but fell when Boriolo, who had king-queen, flopped a pair of queens. 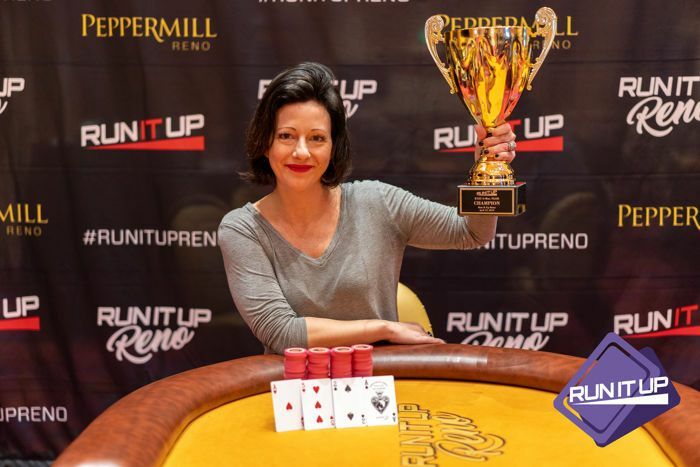 Sarah Sherman captures a RIU Reno trophy. The PokerNews Live Reporting Team is focused on five events at the RIU Reno VIII, but there are plenty of side events throughout including Saturday’s $125 6-Max NLO8 $5K GTD. That tournament attracted 91 entrants and created an $8,827 prize pool. Among those to make a deep run but fall short of the final table were Eric Nelson (15th - $180), Doug Charles (14th - $180), John Lewis (13th - $180), Michael Postle (12th - $220), Patrick Tardif (11th - $220), Albert Ng (10th - $220), Sean Lukito (9th - $270), Joe Brindle (8th - $330), and Richard West (7th - $330). In the end, Sarah Sherman of Ashland, Oregon came out on top to win the title and a $2,000 top prize. PokerNews’ coverage of the RIU Reno VIII will continue Monday with live updates from the one-day $235 NLH Pro Bounty ($300 Pro Bounty).Check out our dedicated portal here for all things RIU Reno. Everybody needs an account at one of these online poker rooms! They're the biggest, the best, and we get you the best poker bonuses. Check out our online poker section for details on all the online poker rooms around. White Orchid Slot Machine: Play for FREE or with a BONUS!